Internationally renowned Bible teacher Joyce Meyer draws on her own history of abuse to show women how Christ's redeeming love heals emotional wounds and brings joy to life.Can a woman who has been deeply hurt by life's circumstances be healed, heart and soul? If she has been wounded by a man she loved and trusted, can she love and trust again? As a woman who endured years of abuse, abandonment, and betrayal by those closest to her, Joyce Meyer can answer with a resounding "yes! "Meyer's positivity comes from living her own journey, and from seeing so many women who don't believe they can fully overcome their pain--or even know where to begin--find the guidance they need in the life-changing wisdom of the Bible.Meyer's bestseller Beauty for Ashes told of her personal story of healing. Now, with the passage of more time, HEALING THE SOUL OF A WOMAN delves deeper into Joyce's story and the journey of healing for all women. Each chapter guides you through whatever obstacles may be holding you back to find your true destiny as God's beloved. God can heal all pain, and He wants to do this in you. 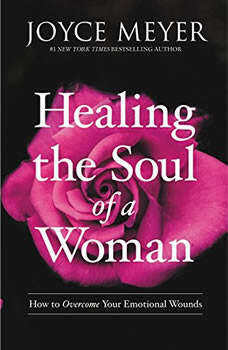 Let HEALING THE SOUL OF A WOMAN be the first step toward the wonderful, joyful future God intends for you.